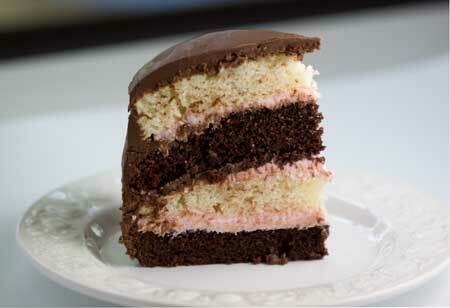 You are here: Home / Uncategorized / Duncan Hines Frosting Creations Giveaway! Thanks to All You Magazine and Duncan Hines for today’s giveaway. 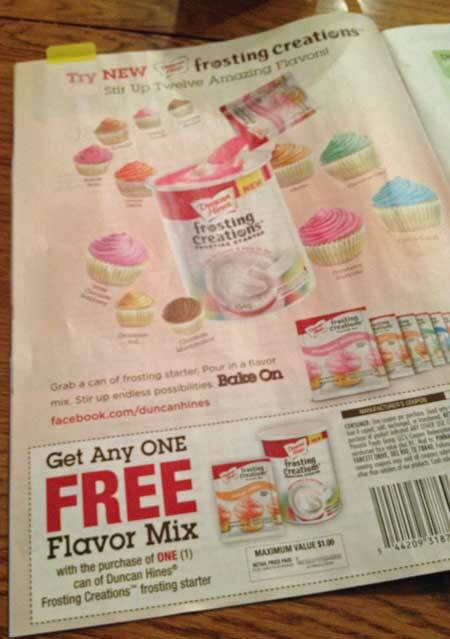 To promote new Duncan Hines Frosting Creations, they are offering three readers sample kits with a copy of All You magazine, four boxes of cake mix, and four different flavors of Frosting Creations, a product designed to help you “unleash your inner dessert artist”. 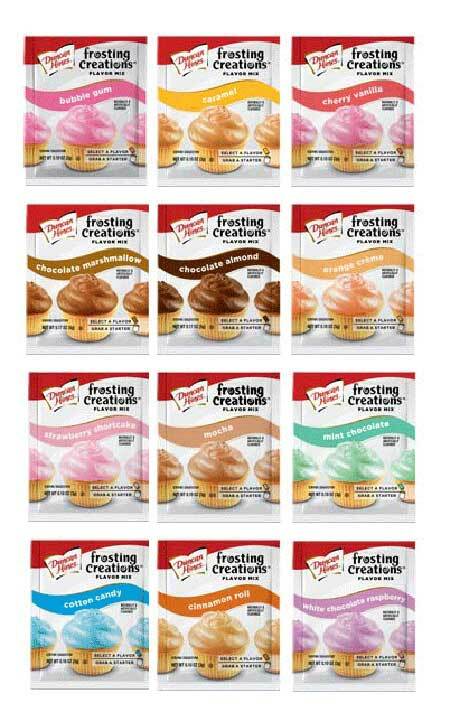 Frosting Creations is a plain carton of frosting, to which you stir in a flavored mix. The idea is to use your imagination, mix and match flavors and execute all those great ideas floating around in your head. With 12 varieties, you have plenty to choose from. 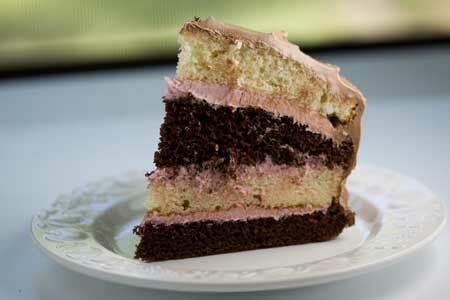 I started easy and used the Strawberry Shortcake Frosting Creations as a filling for this Neapolitan themed cake. The Strawberry Shortcake filling had a light mousse-like texture that contrasted nicely to the firm, scratch frosting I used for coating. I tested the same cake idea using Cherry-Vanilla Frosting Creations as the filling and Chocolate Marshmallow Frosting Creations as the coating. That worked well too, though in hindsight I wish I had coordinated the cherry filling with something pistachio and almond to make “Spumoni”. I’ll save that idea for later. The point is, the different flavors give you the convenience of experimenting without the time consuming task of developing a scratch, flavored icing. You can choose from Cinnamon Roll, Cotton Candy, Chocolate Mint, Strawberry Shortcake, Chocolate Almond, Bubble Gum, Orange Crème, Mocha, Chocolate Marshmallow, White Chocolate Raspberry, Cherry Vanilla, and Caramel. Of the ones I tested, I liked the Chocolate Marshmallow the best and am curious to try the Caramel and Mocha. Now it’s time for your opinion. If you’d like to sample the Frosting Creations, tell me your favorite flavor combination of all time. For instance, I think mine is graham, marshmallow and milk chocolate, but I also like chocolate and peanut butter. The giveaway ends April 1 at midnight, and the next day I’ll email 3 random readers to let them know they’ve won. Until then, look for Frosting Creations at Wal*Mart and Target (it will start appearing at other grocery stores on April 9) and pick up a copy of the April issue of All You Magazine for a handy Frosting Creations coupon. I’m a chocolate and mint kind of girl, but the mango/chili sounds divine as well! Hands down, chocolate and peppermint! Chocolate with anything! Mint, peanut butter, marshmallow, cherry…. Mine has to be strawberry lemonade. Which aren’t flavors on here but I wonder how the caramel taste. Peanut butter, chocolate, and caramel. Dark chocolate and almond or brown sugar and cinnamon. My favorite flavor combination? Hmmm, probably chocolate-mocha-almond — a combo that’s not too sweet and with a little crunch. I haven’t seen this new magazine yet, but will look for it the next time I go to the store. Thanks for the heads up…. I’ve always loved chocolate and peanuts or peanutbutter. but just discovered the wonderful blend of dark chocolate and huckleberry – YUM! Chocolate and peanut butter or chocolate and raspberries…they seem a little obvious, but there’s a reason why they’re classics! Chocolate and peanut butter is one of my favorites, though I’m also loving chocolate and pretzel right now. Is pretzel a flavor? I don’t know – but it tastes delicious! I actually saw these in the store the other day and i really really wanted to pick one up!! Id love to try out the cotton candy with caramel! Can’t go wrong with peanut butter and chocolate…..
Cinnamon roll and caramel do it for me! I love chocolate and raspberries!! Oh my goodness these would be fantastic for the deployed bf! Since I can’t make homemade flavored bc or send any fillings! Can’t wait for them to come out! My fav combo is blueberry & vanilla…. or chocolate & pb of course! these look like a lot of fun! my all time favorite has to be chocolate & peanut butter. I would really love the cotton candy flavored frosting with a fun colorful vanilla cake. I love caramel with everything and nuts. I just love mint and chocolate! The Cherry vanilla tempts me, I think with white chocolate sounds good. I wonder what the strawberry shortcake frosting would add to a jello poke white cake with strawberries as garnish. And mint chocolate goes with everything! Chocolate and peanut butter.. you can never go wrong with that! My favorite combination is cinnamon and sugar! Chocolate and coffee or vanilla and coffee or strawberry and almond. Mmmmm. Or cream cheese and red velvet. Too many to choose from! I just love PB & Banana plain or on a sandwich/toast. Sometimes I’ll do almond butter instead. I like mango with chile. This is a hard question! Chocolate-marshmallow-caramel (a la Ben & Jerry’s Phish Food) is high up on my list. Also, cinnamon & sugar. Chocolate-hazelnut. Strawberries & cream. Fun giveaway! I’m with you on the chocolate/PB combination! Hard to decide between chocolate and peanut butter or chocolate and mint. Rasberry and Cream OR eggnog and buttered pecan. I used the Cherry Vanilla on a Cherry cake. Yummy!! Coffee & heath bar or chocolate & mint – can’t decide. chocolate and coffee — yum! My favorite flavor combination is white chocolate, marshmallow, and oreo. gotta be chocolate & peanut butter! Peanut butter and chocolate is always a winner for me! My all-time favorite flavor combo is the classic peanut butter and chocolate. I love dark chocolate with strawberry! Yum! Chocolate and mint! Freshness of mint and smooth melt in your mouth chocolate, yum! Chocolate and Peanut Butter for sure! Chocolate and cherry always sends me! Brown sugar & toasted pecan is my favorite combination. Thanks for the chance to win. I love chocolate and raspberry or chocolate and peanut butter. Chocolate cake and mint with a fluffy buttercream frosting. I think Mocha and Caramel would be great together. chocolate and marshmallow is my absolute favorite! I love chocolate and marshmallow, but chocolate, salted caramel and pecan is a close 2nd! I love white chocolate and cranberry! Amazing every time! I love chocolate and mint! Hands down, it’s Peanut Butter and Chocolate!!! Never seems to fail me……. Has to be dark chocolate and almond! My favorite is probably marshmallow and peanut butter! Chocolate and peanut butter is unbeatable to me! It’s a classic combination, and it’s sooo delicious. Orange creme; I have always liked the orange ice cream things I used get when I was a kid. My favorite would be chocolate and peanut butter — preferably dark (maybe even bittersweet) chocolate and crunchy peanut butter! Is cookie dough a flavor? If so, cookie dough and peanut butter. Mocha – chocolate and coffee gets me everytime! My favorite flavor combination is coffee and Heath bar. If I can’t have just chocolate (and the more the better) then I would choose chocolate and peanut butter. Thanks for the giveaway! This would probably be sugar and cinnamon! Pineapple and marshmallow, but chocolate and raspberry would be my second choice. What’s with the sea salt and chocolate stuff? New idea to me. chocolate, nuts and sea salt. I love chocolate and caramel! Also I am with you on the peanut butter chocolate combo! Can’t wait to try these out! Hope Inwin! How about carmel and cotton candy for a summer carnival feel. Peanut butter and chocolate is my all time cake frosting combination with vanila on vanilla being a close second! Being a kid at heart I kind of can’t wait to try the bubble gum and cotton candy flavors of this!! Chocolate + mint is my FAVORITE flavor combo! Mint and chocolate is definitely my favorite! PB & Dark Chocolate! Yum! Salted caramel and chocolate and peanut butter are tied for my favourite combos. Lemon and meringue – boring perhaps, but amazing, as a million pies can attest! Chocolate, marshmallow and caramel, like a candy bar! hmmm i love chocolate & pumpkin, chocolate & banana, banana & peanut butter (and chocolate), oh jeez there are just too many. I love salted caramel with chocolate. Yum!! Favorite of all time??? Not sure I could narrow it down to one combo, so my favorite today is dark chocolate and coconut! My favorite combo of flavors would be chocolate (milk) and caramel. I’m excited for the mint chocolate. I think my favorite combo has always been pb and chocolate though. oh I love cinnamon and vanilla too. these look like a lot of fun. I’m a caramel, chocolate and marshmallow girl too! I love Lemon and Raspberry together! Chocolate and peanut butter all the way! Peanut butter, dark chocolate and white chocolate! My favorite combo is chocolate and mint. I have been loving chocolate and sea salt lately, but basically chocolate and anything tastes amazing. Mmm, I’m a chocolate and PB girl, too. But I love chocolate and anything (chocolate mint, chocolate cherry, chocolate orange…). PB & chocolate, or sea salt and just about anything! (caramel, chocolate, vanilla, bourbon….) Fruit and vanilla or fruit and cheesecake are also up there…. Definitely chocolate and peanut butter. Yum!! chocolate with mint is my favorite. other likes are vanilla with any citrus and also chocolate with coffee. I’m a chocolate and strawberry combo person. But love cherry and chocolate too!!! I love strawberry and chocolate together. Decadent! That’s fun! Peanut butter and chocolate is my favorite flavor combo, with cheddar and apple a close second (but weirder for a cupcake). pb and pumpkin! i’d love to win this! I love salted caramel and chocolate together in frosting!